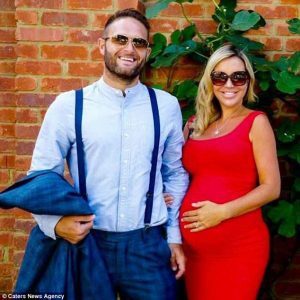 A mother-of-five desperate to find a solution for her baby’s eczema has claimed she cured within the space of a week using cream from a high street beauty store. 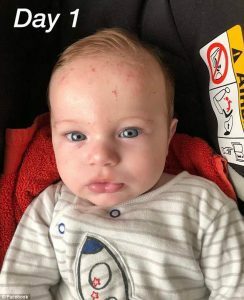 Sarah Rudd, 36, from Poole, Dorset, shared pictures of her youngest son Cash’s inflamed forehead on Facebook, explaining that he had been blighted with the condition since birth and that no prescription medication had worked. 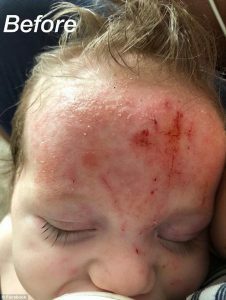 A photo she said was taken just seven days later shows five-month-old Cash’s painful looking flare-up has vanished. Sarah said the astonishing transformation was the result of using the hand and body lotion Dream Cream by Lush, which costs just £6.95 for 100ml. 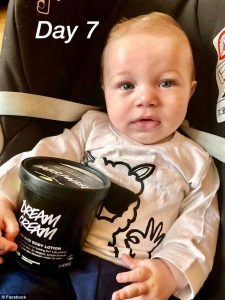 The delighted mum said the cream had an almost immediate impact on her baby’s skin, which was significantly improved after just one day of using it. The cream contains soothing ingredients such as oat milk, rose water, extra virgin olive oil, organic cocoa butter, chamomile, tea tree and lavender oil. 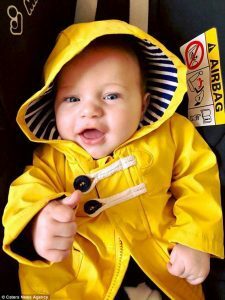 Sarah explained that she had tried countless different medications as well as swapping to a dairy-free formula to tackle Cash’s eczema. 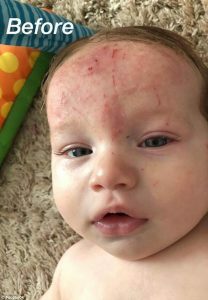 Sharing images of her son before treating his skin with the Dream Cream and then afterward she said: ‘Final post about the baby’s skin, most of you saw he was a hot mess last month with eczema he’d had since birth. 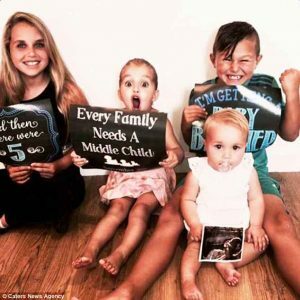 She added: ‘Tried dairy free formula, Dermol, Nizarol, Aveeno, Oilatum…. nothing made a difference. ‘He didn’t sleep for four months because he scratched non stop all night. Sarah told the Evening Standard that she had been to the doctor three times and visited a dermatologist, who told her to keep a diary. ‘I put it on him on March 23 and it was clear almost 24 hours later. And it’s never come back! I pop a bit on him every morning, it’s lovely stuff. 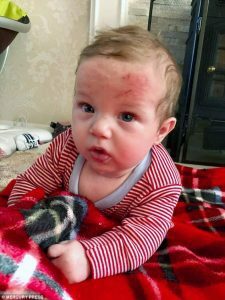 Another mother left a review of the cream on the site, echoing a similar sentiment: ‘I have been searching for a cream for months for my six-month-old babies eczema and dry skin and saw this recommended on a forum/ discussion board. ‘We were at our wit’s end and didn’t know where to turn after all the doctor’s creams had failed. ‘We no longer wanted to use steroid creams so started to look at natural products. Many didn’t make it worse but nor did they make it better and he was left with very flaky skin all over his body and red patches that would flare from time to time. ‘Have had psoriasis on elbows for many years, I was in a coma 3 years ago and it all healed up don’t know how,’ said another woman.